There is nothing more welcoming than a warm bubbling spa in the winter or a cool relaxing float in a spa in summer. 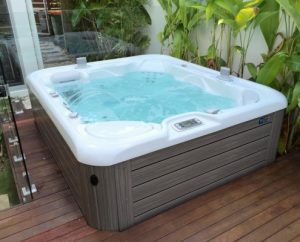 (for information on the CoolZone Hot Tub Cooling System visit the Brisbane Spa Centre website) For those who suffer from arthritis or sore muscles, the gentle massage of a spa can provide relief as well as relaxation. As specialist deck builders, we have some great spa deck ideas to share with you. However, before you rush out and buy a spa, you do need to be aware that spas are now covered by the same pool safety standards as swimming pools which includes fencing your spa for safety. Whilst these requirements might seem limiting, in fact there are many ways to create wonderful spa decks whilst still adhering to the Queensland legislation but this is a subject for another day. A spa sitting on a concrete base may be practical but is certainly does not take advantage of the attractive and classy addition to your home. There is so much scope to make your spa a wonderful feature (that wow factor) of your garden that it is a shame not to consider some of the spa deck ideas below. An easy and very effective way to create your spa as a focus point is by buying a layered deck up to your spa. This spa deck idea makes the spa look as if it had always been there and was an integral part of the garden. On a practical level, the different layers also provide steps for seating or somewhere to put the bottle of bubbly. 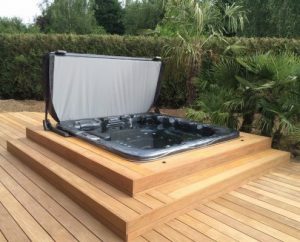 Most spas come with timber (often cedar) or synthetic ‘wood-look’) cabinets. In an ideal world it would be great if you could match the timber used in the spa cabinet with that of the surrounding decking. If this is not possible, sometimes a complete contrast really features the spa with the deck being the complementary background. The spa below has a slightly different decking timber to the (what appears to be) a synthetic ‘wood-look’ cabinet. The mix of the two colours is sufficiently complementary and the provision of tropical greenery next to the spa really creates the holiday feel. 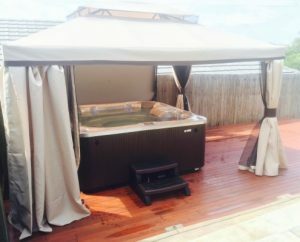 You can (if you look carefully to the left of the image) also see that the spa has conformed to Queensland requirements by the inclusion of a glass barrier. You can’t beat the spa below for a sense of fun and largess – as well as being very practical. The timber deck is a much lighter colour than that of the spa cabinet, providing an excellent contrast. The colour of the spa cabinet has also been cleverly included in the gazebo curtains. On the practical side, you have total privacy as well as weather protection (to a certain degree) from rain and wind. The spa deck in this instance definitely takes a supporting role to the grandeur of the gazebo. 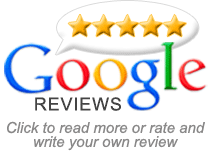 All We Do Is Decks are Brisbane deck builder specialists. We can design, obtain approval and construct the deck that matches your lifestyle, your home and garden and your budget. If you would like any additional information (including some more spa deck ideas) please contact us on 0412 896 744.